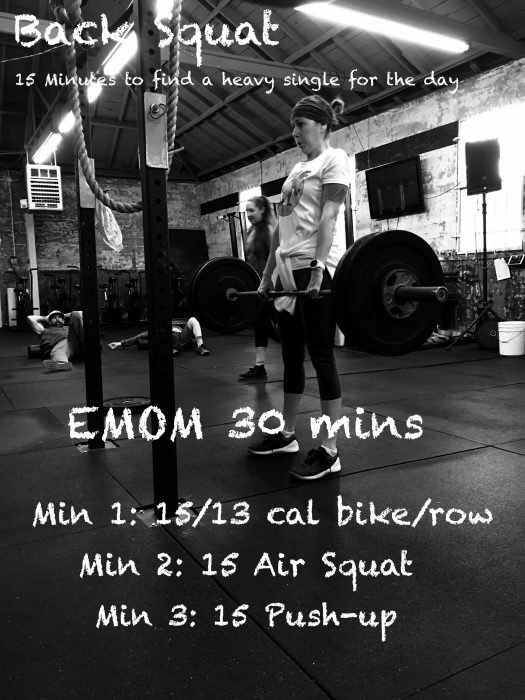 Heavy Back Squat to start things off for the day followed up with the EMOM. It’s only 15 min to find your heavy for the day and this is intended to start with and empty barbell. Don’t stress on finding a “PR” today but let it be what it is. Make jumps that make sense to you and even if you do this on the 2 min you will still have 7 sets of increasing weight which can allow for some heavy weight on the barbell. The goal behind this is to get the heart rate up and get some good movement in but none of this is going to be too killer. You will need to stay on top of the pacing on the bike but the air squat and push up should allow for good, quality movement and you should have around :20 sec or more to rest before the start of the next min. If you don’t have a bike sub out a row for the same calories. Keep in mind this shouldn’t be too killer so if you need to back off on the reps to keep you moving please do.